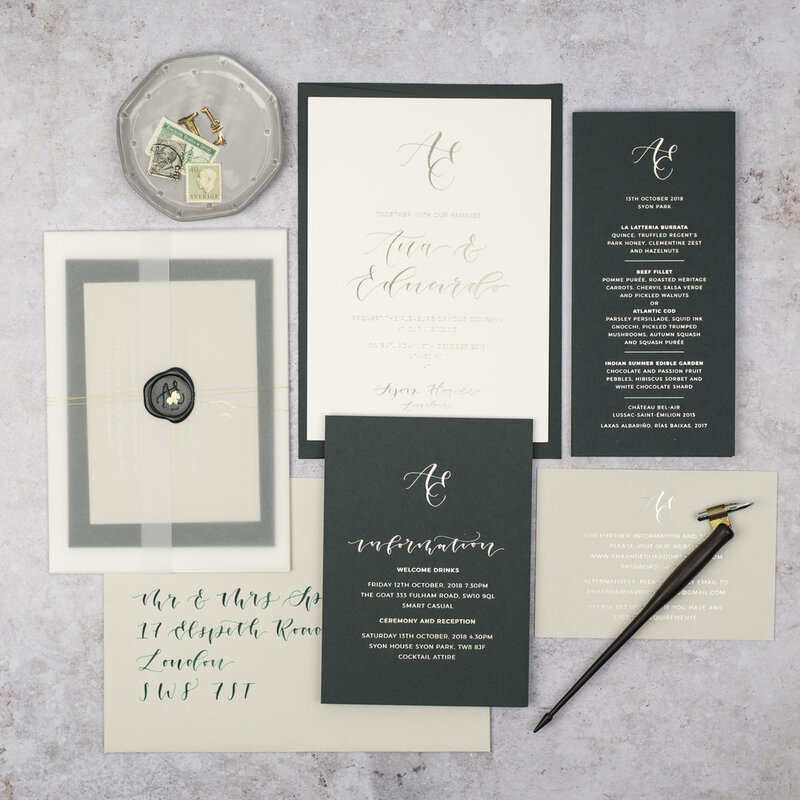 Bespoke wedding stationery is perfect for the couple who are looking for unique paper details with a personal touch. The designs are created especially for you taking into account your style, personality and of course your love. The finished product will be something that you and your guests will treasure forever as a great reminder of your wonderful wedding day. The sky is the limit with bespoke designs and together we will look at different options with printing and hand finishing to make a stunning invite you will be so proud to send your guests. I offer full colour digital, white digital, hot foiling and letterpress printing if you would like to see samples of these along with examples of my bespoke work then you can order a printing samples box here. Digital printing is the most common form of printing and the most reasonably priced. It is what your home or office printer does but on a much larger and higher quality scale. It is great for full colour designs and also due to new technologies you can now print white digital onto coloured card stock. Letterpress printing is one of the oldest forms of printing, it is a form of relief printing where an inked surface is pushed into the surface of paper leaving the most beautiful printed effect. Letterpress printing is a very luxurious form of printing and can be expensive especially if you want more than one colour as you need a new plate for each colour which will then be printed separately. Hot foil stamping is another form of relief printing and creates the most stunning effect. Traditionally hot foil is done in metallic colours but now you can buy foils in neons, pastels and holographic effects making this form of printing a really fun way to inject colour into your invitations. As with letterpress it is a luxury print finish so therefore comes in more expensive than digital but it is totally worth it as the effect is stunning. You can also opt for hot foil details on a digitally printed design. Turnaround time for bespoke suites is 6 - 10 weeks depending on complexity and printing processes. I only take on a limited number a year so please get in contact here to chat about the possibilities. You can find price guidelines here and read more about the bespoke process here.